Saint Jerome Emiliani, Priest - My Catholic Life! In the year 1202, a wealthy young Italian man joined the cavalry of his town’s militia. The inexperienced soldiers went into battle against a neighboring town’s larger force and were obliterated. Most of the retreating soldiers were run through with lances and left for dead in the mud. But at least one was spared. He was an aristocrat wearing fine clothes and new, expensive armor. He was worth taking hostage for ransom. The captive suffered in a dark, miserable prison for a full year before his father made the payment for his release. He returned to his hometown a changed man. That town was Assisi. That man was Francis. 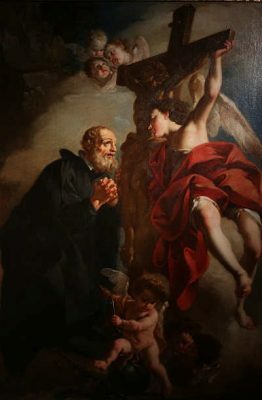 Today’s saint, Jerome Emiliani, endured much the same. He was a soldier in the city state of Venice and was appointed the commander of a fortress. In a battle against a league of city states, the fortress fell and Jerome was imprisoned. A heavy chain was wrapped around his neck, hands, and feet, and fastened to a huge chunk of marble in an underground prison. He was forgotten, alone, and treated like an animal in the gloom of a dungeon. This was the pivot point. He repented of his godless life. He prayed. He dedicated himself to the Madonna. And then, somehow, he escaped, chains in hand, and fled to a nearby city. He walked through the doors of the local church and headed to the front to fulfill a fresh vow. He slowly approached a much venerated Virgin and placed his chains on the altar before her. He knelt, bowed his head, and prayed. His life was about to begin again. Some pivot points can turn a life’s straight line into a right angle. Other lives change slowly, bending like an arc over a long span of years. The deprivations endured by Saint Francis of Assisi and Saint Jerome Emiliani occurred suddenly. These men were comfortable, had money, and were supported by family and friends. Then, shockingly, they were naked, alone, and chained. Saint Jerome could have despaired in his imprisonment. Many people do. He could have rejected God, understood his sufferings as a sign of God’s disfavor, become bitter, and given up. Instead, he persevered. His imprisonment was a purification. He gave his suffering purpose. Once free, he was like a man born anew, grateful that the heavy prison chains no longer weighed down his body to the floor. Once he started sprinting away from that prison fortress, it was like Saint Jerome never stopped running. He studied, was ordained a priest, and travelled throughout Northern Italy founding orphanages, hospitals, and homes for abandoned children, fallen women, and outcasts of all kinds. Exercising his priestly ministry in a Europe newly split by Protestant heresies, Jerome also wrote perhaps the first question-and-answer catechism in order to inculcate Catholic doctrine in his charges. Like so many saints, he seemed to be everywhere at once, caring for everyone except himself. While tending to the sick, he became infected and died in 1537, a martyr to generosity. He was, naturally, the kind of man who attracted followers. They eventually formed into a religious Congregation and received ecclesiastical approbation in 1540. 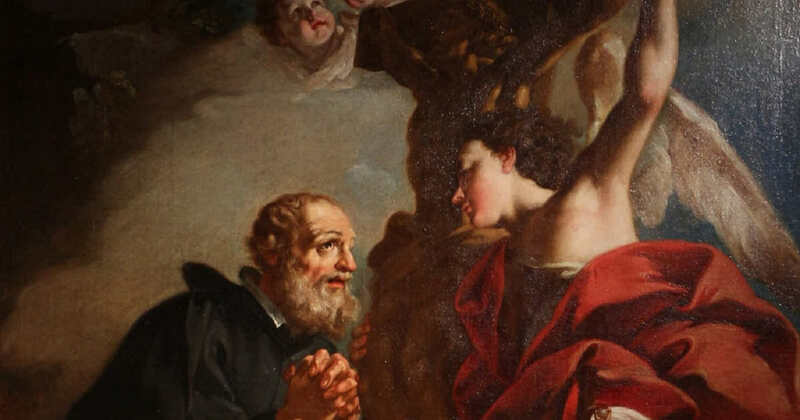 Saint Jerome was canonized in 1767 and named the Patron Saint of orphans and abandoned children in 1928. His life hinged on one pivot. It is a lesson. Emotional, physical, or psychological suffering, when conquered or controlled, can be a prelude to intense gratitude and generosity. No one walks down the street more free than a former hostage. No one enjoys a warm, comfortable bed like someone who once slept on asphalt. No one gulps a breath of fresh morning air quite like someone who has just heard from the doctor that the cancer is gone. Saint Jerome never lost the wonder and gratitude that filled his heart at the moment of his liberation. All was new. All was young. The world was his. And he would place all his power and energy in God’s service because he was a survivor. Saint Jerome Emiliani, you overcame confinement to live a fruitful life dedicated to God and man. Help all who are confined in any way—physically, financially, emotionally, spiritually, or psychologically—to overcome whatever binds them and to live a life without bitterness.